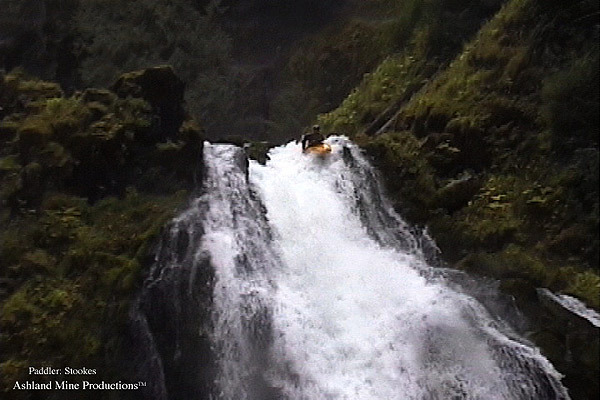 On the weekend of October 20th, 2001 we drove up from Ashland to paddle the headwaters of the North Fork of the Middle Fork Willamette. Accompanying me were three other Ashland-area boaters: Judd Lehman, Samantha Glaes, and Jeff Ellis. I had read and seen photos of this section in Dave McNeil's report on your site, so we had a pretty good idea what we were in for. My planning was highly last moment as usual, so we had to go without any additional imformation and put our trust in the river gods. We ended up putting in on Saturday at a point just over two miles above three-in-a-row falls where the Blair lake trail crosses the NFMF. Needless to say, the run supplied the much anticipated portage fest that we had been expecting. Putting on we expected to get a full on "log-fest," so when the first 3/4 miles offered nothing but spicy little log choked rapids we were not surprised. Portaging was a bit tricky, but completely managable throughout Although choked above and below with dangerous strainers, there was one long boulder garden that offered an oasis of whitewater in this top section of boating. Aside from a dangerous "crack drop" just downstream, the river lost it's bouldery character and turned ledgy in big way. A chunky 20 foot slide led to the lip of the twenty foot double drop pictured below. Judd boofs hard over the double falls. The next drop downstream turned out to be a seventy to eighty foot monster. No one from our party ran it, but it might go for some one who was ultra psyched! At this point we took the liberty to hike our sorry asses 4 miles and a thousand vertical feet out of the canyon and back to our camp at Skookum Creek for a little well deserved rest and relaxation. 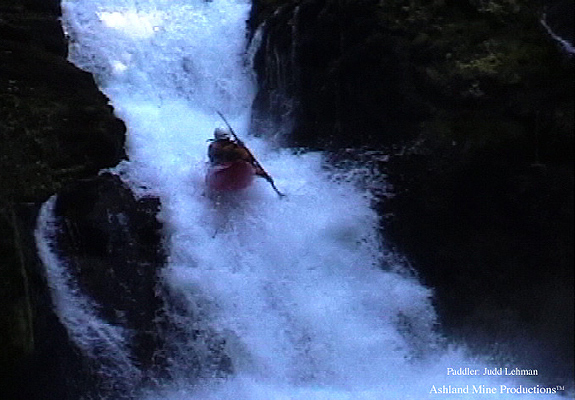 The next day brought renewed strength, and a first attempt at the 50 to 60 foot waterfall immediately downstream from the first huge waterfall. I probed this falls only to barrel roll during the last 30 feet, ejecting me out of my boat and breaking my paddle. Ben at the lip of the big one. 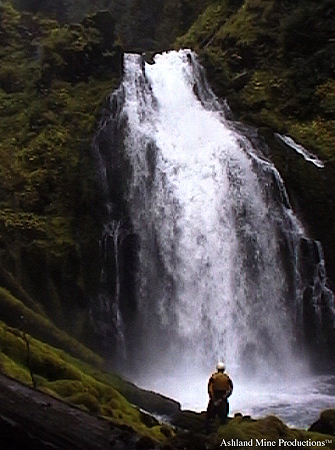 Looking up at the same falls. After getting pitched off the middle of the big falls and swimming, our crew decided to lick its wounds and save the rest for another day. Shuttle Info: 5-6 mile hike from Skookum Creek to where the Blair lake trail crosses the NFMF. If you've got access to the proverbial shuttle bunny and a burly rig, check out the back roads off Waldo Lake; this could eliminate the majority of the hike. Bring a compass (or better yet a GPS) and your sense of adventure. The bottom half of the run, including one last 40+ foot waterfall still needs to be boated. Other highlights of the trip included two full days of hiking into and out of the canyon and some sweet drops in between wood infestation. 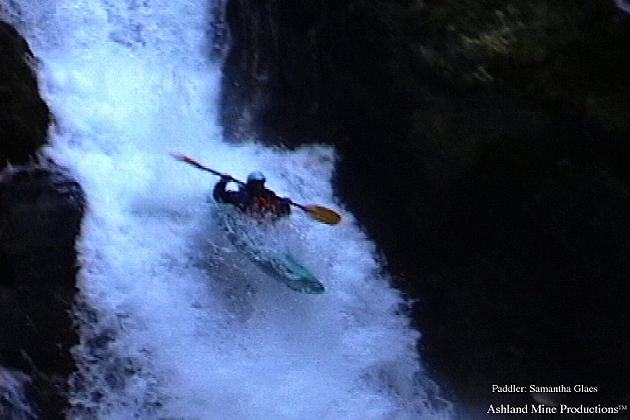 Editor's note: Footage from this trip and others can be seen on the upcoming kayaking video 'No big names' by Ashland Mine Productions.